The launch of Netflix UK is finally official as the streaming service finally unveiled it’s content to a hungry UK and Irish public. But initial browsing shows not much content to get excited about. A quick look showed a lot of old movies and TV shows but very little premium content (as our netflix reviews and comments below show). That did not stop Netflix having a pop at Amazon owned rival, Lovefilm. 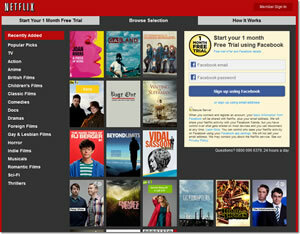 Lovefilm, who have around 2 million subscribers in the UK, have countered with the service Lovefilm Instant. The streaming only service manages to undercut Netflix’s prices and although launched on December 6th, Lovefilm have confirmed the price is staying at this level. Netflix are promising to beef up the range of content, and certainly have setup a few deals recently with broadcasters, ITV, BBC Worldwide and Channel 4. Expect better content and more of it as the service gets rolling. To compliment the launch, Hastings also revealed more content deals that include Disney, Sony and Twentieth Century Fox. One thing Netflix have not brought across the pond is DVD rental, which Lovefilm are offering. It is obvious that Netflix are going digital only, and if they can get the content and pricing right, they may become a big player in the UK. But Lovefilm seems to have the better range at this time, so it is gloves off and fight, fight, fight. Wow Netflix has arrived. I just had a look through and all they got is a few films in each category to stream! Then there are some crappy old tv shows! Unless they improve they have no hope. I don’t even wanna sign up for the free trial if this is all the mighty Netflix have to offer!! I couldn’t agree more, after such a funfair about Netflix hitting the UK shores, they have done so in very un american fashion – lacking in force/content. Reminiscent of Love Film’s online release and extremely disappointing. It’s worth saying that without signing up you can’t see the vast majority of the content available. I’m pretty impressed with the range of content for day one. The service itself is certainly head and shoulders about LoveFilm’s dreadful streaming. Netflix seems to have better TV content, as in it has some. LoveFilm (at least via XBox, which seems to have less content than LoveFilm’s website) doesn’t have any TV. To be honest, both are pretty piss poor contentwise. i think tabloids are giving uk netflix a hard time, like this article, and so many other articles, sating about fierce competiton netflix has in the uk. WHAT COMPETITION! Sky is only for sky subscribers, and the amount of repeats that they show, i never need to watch thier streaming content anyway, there is no need. plus to get sky movies and hd it costs me around £40 a month. i have tried lovefilm streaming and dvd rental, and while thier rental is good, cheaper than paying £3.50 everytime to watch a new release, thier streaming service is horrible. they still want to charge you £3.50 for anything new. the streaming on some free movies would be just ok, and other movies it would be totally crap. like youtube back in 2003. thier selection is lame, they would add new streaming content while taking away older content, so they never really have a huge library. did i mention the pixelated quality and freezez you get. plus thier service is only availabe on a few wifi enabled devices. iphone app. (what about android app)not on wifi tv’s dvds? i tried netflix yesterday on my ps3 and android phone. and the whole experience is like from another planet. the content on day one! looks alot larger (once you log in) than on lovefilm which has been running for quite a while now, the quality is brilliant much better than lovefilm, and navigating through menus is so much better integrated, no more waiting for different pages to load. love film can take thier £1 saving and stick it up thier …! netflix is exactly what the uk needed, too many companies in the uk are sitting on thier asses and being lazy with us consumers because they have no real competition, while taking our hard earned money, hopefully lovefilm will get thier act together now and start offering a proper streaming service. for me however it’s too little to late. goodbye lovefilm! goodbye Sky! I have just signed upto netflix expecting a far far better service and content than lovefilm. But oh boy what a disappointment it was if content does not improve i will defiantely be canceling my subscription. as lovefilm has by far the better range of FILMS. Also netflix freezes yet had no such problem with lovefilm. i defiantely dont recommend. I have been using this service and I must admit the HD quality is GREAT. The downside as you all mention is the amount of content it has. There have been a few things removed too, so perhaps agreements are not in place. Seeing how they paid like 1.2bn$ for the content on the American service, then I can see how they cant stack it with all that content straight away on the UK side. The important thing will be how fast content shows up. Lovefilm quality is bad, but if you take the mail option with it then you can get loads of BD’s each month and enjoy HighDef on the great films and live with the SD on the crappy film/shows. I havent measured bandwith yet, and neither of my Sony TV’s have the netflix app so I cant see how well the app does there. There is a reason lovefilm cut their price, there is a reason lovefilm is about to start offering HD — That reason is competition! Without netflix (or another company) fighting for market space then lovefilm is not going to grow in quality. and the quality is fantastic. Hoping the content improves soon! To be honest, I’d say the content isn’t that bad, especially for TV. I expect that more will be added as time goes on as well. Maybe just my tastes, but the content for me is just the kind of thing I like anyway, so I’ma stick with it. For £5.99 a month, I am not complaining. Plus, haven’t had a problem with quality/playback, which is a definite thumbs up from me. Also, James: “I have just signed upto netflix expecting a far far better service and content than lovefilm. But oh boy what a disappointment it was if content does not improve i will defiantely be canceling my subscription. as lovefilm has by far the better range of FILMS. Also netflix freezes yet had no such problem with lovefilm. i defiantely dont recommend.” – Lovefilm employe, much? For £5.99 a month, what do you people expect, Blockbusters? Netflix has only just launched here, I can’t even begin to imagine how complicated it is to transfer massive, expensive content over to the UK. If I were paying £20 a month for this service, I would be disappointed with the content, but as it is, it’s a pretty sweet deal. It can only improve, and I’d rather do this from day 1 than later when they up their content and suddenly new memberships skyrocket in price..
Well I’ve had the Netflix service for a month now, and have to admit I like the style, quality of streaming, amount of my gadgets I can use it on etc.. The only problem is still what was wrong 4 weeks ago, and that is content. I have used the US version of Netflix, everything is the same as the UK streaming service, apart from the fact that there is virtually limitless content on the US version. No matter what your viewing pleasure, in the US no matter how picky you are they have more content than anyone could watch in several lifetimes. Now the UK, 4 weeks later, and it’s still virtually empty. You can’t be choosy as it would take you a week or two to watch everything you actually want to see, then your watching movies you have seen before, then by week 3 your watching movies you probably wouldn’t rent/watch normally. Nothing much has been added, every day when I switch it on I’m hoping to see a boost of content…but every day I’m disappointed. I have previously been a long time customer of lovefilm, mainly for streaming. At least they have a very large database of films etc, about 90% more than Netflix UK. It may not look as good, in presentation or ease of use and certainly most are no where near the quality of the HD streaming of Netflix. But at least when I had Lovefilm, I wasn’t watching the same film again a few weeks later! Errrrr… “so many films” says Ally above?? What? I’ve just signed up and there are hardly any… 75 per genre maximum. That’s farcical! Maybe 75’s a big number for kids today?! (oh dear!…). All up, it’s under 1000 films. The interface also seems to be made for 10 year olds. A basic ‘search’ facility and then about 16-18 genres listed (if you count ‘popular on facebook’ as a genre! ), with between 25-75 in each category. ‘Foreign’ films don’t even get separated into country. If this doesn’t improve pronto (and they’ve been launched since Jan haven’t they?) then I will cancel before the free trial’s up. Love Film’s efforts, which I must say have started to improve with this competition (I noticed yesterday the ‘fast connection’ option in their on demand service), are far superior. You can’t sign people up to a service that has 25 million users in the USA (i.e. it’s not a ‘start up’ company) and expect them to ‘hope’ it improves with time. It’s got to have some substance from the start. Very disappointing. At least with Lovefilm you can change the aspect ratio to what you want, I have a widescreen tv and was forced to watch a movie on Netflix in 1.1, awful. So Neflix might have HD streams so what, Lovefilms SD for me looks just as good, and to those that complain about Lovefilms streaming should get a better connection, mine hasn’t stopped to buffer not once. Netflix library is full of B rated movies, ones that go straight to DVD. Signed up recently, pretty good for me, im able to catch up on a plethora of tv series i havent seen yet. Films indeed are meh, but will improve im sure. Only problem Ive had is lip syncing out with audio on a few episodes, and films such as Donnie Brasco and The Mist. 3 stars out of 5 for the moment. Signed up as soon as they opened but cancelled after the first month. UI great, streaming great but content rubbish. I had been waiting for so long for Netflix UK but when I compare it to the US version it is really third rate. The film are nearly all way to old (and not enough of them) and the TV is mostly the crap that I did not watch first time around. If they sort out the content I will be back but not until they give me a way to have a look at the full content and not just a few picks in each cat. Just cancelled my account. Been a member since day one, but I’ve watched pretty much everything decent on it (Not that there was much there) and there’s no new, quality shows, so I’m out. Having said that I’m 45 years old and fed up with watching TV that is made for teenagers with an IQ less than my waste size … he he he ! I think it’s just what the market needs … an inexpensive way of not watching the crap that they put on BBC, ITV, C4 & C5 ! I have had Netflix for a while now, and the content available is terrible. Basic films that I thought would have been there are not available. Such as rocky films, the mask, behind enemy lines. Could go on forever. Yes, £5.99 is a good price. But my mates have got Netflix US on their ps3 – and the content is awesome. Most of the content we got, i aint even heard of half of them. I’ll give it another month, if the content stays the same I will be cancelling. Tried Lovefilm originally but was really disappointed, unfriendly user interface, streaming problems, and extra charges for anything remotely recent. Have had Netflix now for 6 weeks and its a world away in terms of ease of use and streaming quality, particularly HD. However 8 nearly 9 months after its launch its content range is still rubbish. Good for TV shows, but for movies its laughable, 90% of any popular movie of the last 10 years they won’t have it. For UK users its a real shame still don’t believe that a quality online streaming service for movies exists, and that includes the play station network which is crap, and Sky box office which is also poor. Here’s a blog I’ve made that has a complete, continually updated list of what’s on Netflix UK/Ireland: netflixukcompletelist.blogspot.co.uk. Take a look and let me know what you think. The UK Netflix movie selection is pathetic compared to the USA Netflix selections which has vastly more content and more up to date, blockbuster movies as well as many niche titles from all genres. I have cancelled my subscription and won’t be renewing until the UK store matches up and stops offering up mainly bargain-bucket content. I think Netflix is great. i stream it through my Wii and replaced tv with it completely. it doesnt have everything but it does have a substantial catalogue. I have been using it for three months nearly and I am yet to find a fault with it. Great quality, a large amount of bbc and channel 4 series. Keep it up Netflix, just keep adding more. Hey guys dont worry they did the same here in Canada. The first few months it opened the selection was embarrassing. A few movies of old crappy quality in each section. It takes time to build a library for a new country (they have to negotiate new contracts for each country). Now Canada has atleast 40x the selection. Everymonth they add atleast 300 movies/tv shows. Id wait a year then check out there selection im sure it will be vastly improved by then. With the thing only just released of course it will have a poor selection compared to the longer run and original US site, give it a little while and should have vaster library available to it. well its december and iv been with netflix for over 2 months.. lack of content is a big problem.. they need a better selection of movies.. not tv material.. we can watch tv the traditional way on tv! the layout is poor .. there are movies on there but hard to find.. need better categories , u should be able to type sci-fi and get the sci-fi range of movies. for the people saying its not bad that it works well , yh it does but that shud not b a plus point , working well not freezing or excellent playback should be a standard thing. we do live in the uk in modern times not in a cave next to the neathertal man! oh for the people saying its only £5.99 netflix shud have set a price where they can actually provide the service they said they would and not some half cooked pie!.. and why on earth would you put only the 1st part of a box set e.g. the godfather, starship troopers, pirates of the Caribbean theres loads more. surely netflix arrive but it only allow local server provider, guys try this trickbyte.com I’m sure you will get interest in this DNS service, it has a guide in it on how to install. And for only $2.99/month you can watch movie all you want, and ohh!! btw tricbyte support also fire TV.